An author admitted in court Tuesday to exaggerating his claims that the best-selling "The Da Vinci Code" borrows from his own work. Michael Baigent and Richard Leigh, authors of the 1982 nonfiction book "The Holy Blood and the Holy Grail," are suing Random House, publisher of Dan Brown's book. They claimed that parts of their work formed the basis of Brown's 2003 novel, which has sold more than 40 million copies and has been made into a forthcoming film starring Tom Hanks. They claim that the book didn't just borrow a theory, it stole the whole thrilling jigsaw puzzle they created, CBS News correspondent Richard Roth reports. Not surprisingly, Brown's publisher calls this nonsense. "The publishers of the Da Vinci Code are saying, look, all we have done is take the basic facts in the original work, the premise about Jesus and Mary Magdalene, and turn it into a novel," said Paul Herbert, a media lawyer. "There is no copyright in the facts that we based it on, so where's the claim?" 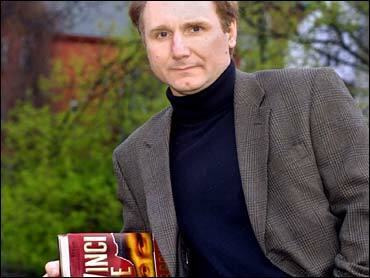 Roth reports that in Britain, "The Da Vinci Code" movie – due out in May – could be delayed if Brown's book loses. But it won't, predicts newspaper publisher Andrew Neil. "The Da Vinci Code is a dripping roast and everybody wants a share of the drips," Neil said. "It's a win-win for everybody. Even the publishers of the two books are the same." In fact, Internet sales of the challengers' book jumped 3,500 percent just one day after the case began, reports Roth. The suit resumed Tuesday at London's High Court after a weeklong break to give the judge time to read both books and related materials. During cross-examination of Baigent, defense attorney James Baldwin attacked the author's sworn testimony, which spanned more than 100 pages. Baldwin said the author's reliance on book reviews to back up claims that Brown had taken 15 central plot points from his own work were "simply false." Baigent made the claims in a written witness statement presented to the court at the beginning of the trial. After a pause, Baigent agreed: "In that case, you are correct ... I think my language was infelicitous, and I think I have to agree with you on that." That set the theme for the rest of the day, in which Baigent was forced to conceded several points in the prosecution's case. The day's proceedings were punctuated with long silences as Baigent peered over his black-rimmed glasses at the lawyers, before he conceded that many of his claims may have been incorrect. Midway through the hearing, Judge Peter Smith asked Baigent how he came to retract so many points from a statement that he had signed only hours earlier. "It means I did not read them (book reviews) with the correct assiduity as I should have done," Baigent said. Lawyers for Random House have said ideas about the life and legacy of Jesus Christ, which two writers claim were stolen, are so general that they are not protected by copyright. Many key themes of Baigent and Leigh's book are not in "The Da Vinci Code." Baigent and Leigh's lawyers say they were not attempting to claim a monopoly on ideas or historical debate, but to prove Brown had "relied heavily" on the earlier work, published in Britain in 1982 and the following year in the United States. The book's third author, Henry Lincoln, is not involved in the case. A lawyer for the plaintiffs, Paul Sutton, refused to comment. If the writers succeed in securing an injunction to bar the use of their material, they could hold up the scheduled May 19 release of "The Da Vinci Code" film. Brown is expected to testify later this week.